As a writer and teacher I'm always looking for new ways to fuel my own writing and ways to inspire my students. 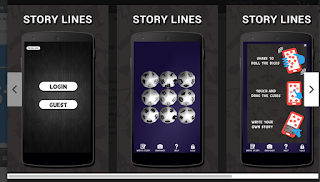 So earlier this year I decided to discover what writing related apps were available. After some time researching apps for iPhones and Android I downloaded a dozen or so. After much 'playing' I whittled my favourites down to the following three apps. I love using story cubes and regularly use them to exercise my 'writing muscle' and in class to help inspire my students. The physical cubes I use in class come in packs of nine giving you 54 images. However these nine dice have ten images each, therefore offering more combinations. 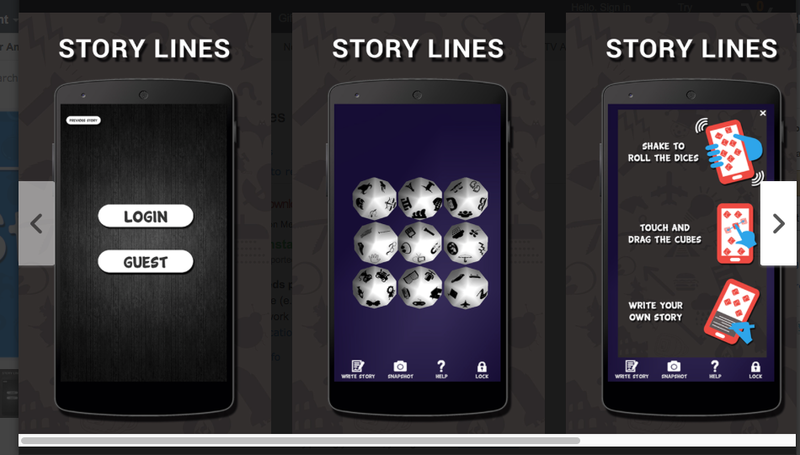 To use you simply shake your phone or tablet and the dice scatter. You can then drag them into some order and lock the image. The one small issue I've found is if you don't lock the screen sometimes the dice roll so you lose the image the dice landed on for that roll. I've only used the app as a 'guest' however if you sign up you can also use the 'write story' facility. This is a great app to have on you when you're sitting in that waiting room or on the train and want to exercise your imagination. 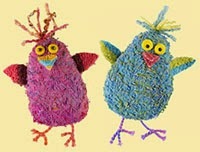 Also after using a few times in class it's a great one to introduce to your students. This app is fun, easy to use and really pushes the creative process. Think fridge magnet or rip it poetry. When you open the app you are supplied with a number of words on a 'board' which provides you with the starting point for your poem. These words you simply drag into place to create your poem. If you struggle there is a pull out 'drawer' (found on the right hand side of the screen) which contains additional words that you can pull into play. 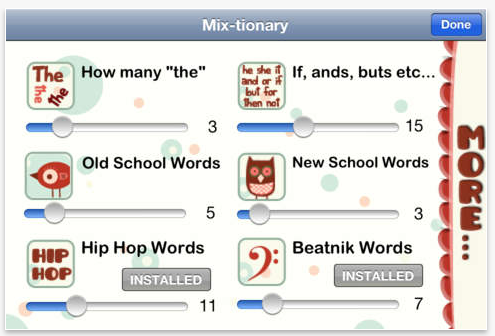 You can increase the number of words by going into the 'mix-tionary' and sliding the selectors. 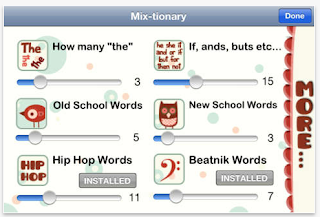 You can download additional dictionaries (shown as installed on the image on the left) from here or download eight dictionaries for a special price from the menu page. 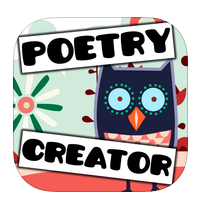 Once you've written your poem you can upload to Facebook to show off your skills, email to yourself or save to the photo album on your device. Do remember if you don't do any of these before you press the double arrow button (second icon from the right along the bottom of the screen) you lose your poem. Unfortunately this app is only available for download onto iPhone and iPad - click here if you want to download which means I won't be able to use in class but it's definitely one I'll be adding to my handouts. 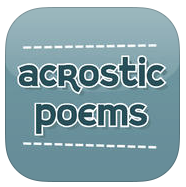 Definition of an acrostic poem (just in case it's not one you've come across before): Is a type of poem where the first, last or other letters in a line spell out a word or phrase. The most common is where the first letters of each line spell out the word or phrase. As with many of the apps I've downloaded over the last couple of months I did so because I wanted to use in my creative writing sessions. So far I've used this one in three sessions. Two were with year 4 and 5 kids whilst the third session was with a group of students who were 60 plus. All three sessions were (thankfully) a success. 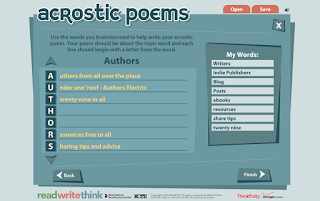 The first screen asks you to enter your name and then the theme/word you wish to use as the basis for your acrostic poem. When you pick your theme you're limited to 14 characters which includes any spaces and it doesn't include a spell checker, so take care as you type. Your next step is to brainstorm ten words that link with your theme. Once you've completed this step simply start to create your poem using the words generated during your brainstorming session. 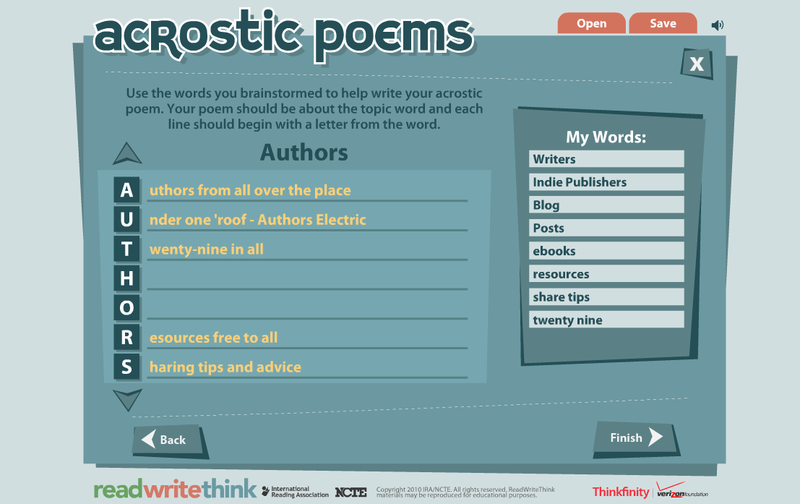 When you've completed your poem, checked your spelling you can save it, share via email or print it off. If you forget to do any of these and click on 'new poem' you are told that the poem will be lost and you're given the chance to save your work. Having seen students use this app in class it's another I'll be adding to my handouts when I update them next. It's also given me a few ideas for new stories which are now safely stored in OneNote. I hope you've found these reviews helpful and if you've used any writing related apps you've enjoyed using please do share below. My latest short story collection Coyote Tales Retold is available on Amazon in ebook format. Also available Meet The Tricksters a collection of 18 short stories featuring Anansi the Trickster Spider, Brer Rabbit and Coyote is available as a paper back and an ebook. Thanks, Lynne, I've never thought of using writing apps. Writing poetry is excellent practise for writing picture books as every word counts and it helps stifle the use of clichés.